This entry was posted on February 10, 2017 by Allison Holland. Say hello to Cara! Cara recently joined the team here at George Weil, and a great addition she is! 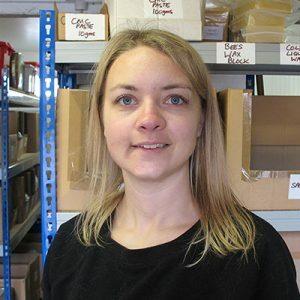 Cara carefully weighs, measures and packs your art and craft materials in our warehouse, ensuring you always receive exactly what you've ordered. She is responsible for checking in stock from our many suppliers, and beautifully displays the products in our showroom. She has already started to re-organise the warehouse, making it easier and faster for us to find, pack, and dispatch your orders. We look forward to continuing working with Cara, and her mum (Sales Manager, Jo) couldn't be happier.